Jane paints mainly in pastel. Her work shows a deep love of rural life. She studies the inner characters of animals and birds and uses both expressive and bold colour, as well as gentle tones, to create a sense of movement. Her convincing compositions are frequently close up and cropped, like portraits, concentrating on the eyes, which engage the onlooker. Jane’s pastels have been hung at the Mall Galleries in London for four years running and from here she has received the Frank Herring Award. Her paintings have also been selected at the Royal West of England Academy, the Llewellyn Alexandra, London and the Leamington Spa ‘Open’. 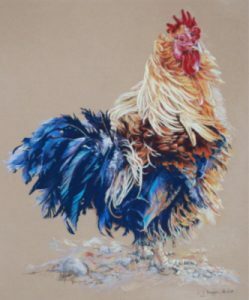 Jane exhibits regularly with groups including the Royal Birmingham Society of Artists, Birmingham Midlands Pastel Society, Association of Midland Artists and the Leamington Studio Artists.